This accessory is a device that automatically intervenes in the case that there is a consistent increase of the temperature inside of the collection tank, emptying a mix of air and water inside the tank through a spray nozzle. In the case where the system is not automatically activated, it’s possible to activate it manually using the appropriate button. The vacuum cleaner is equipped with a touch screen unit on the front. 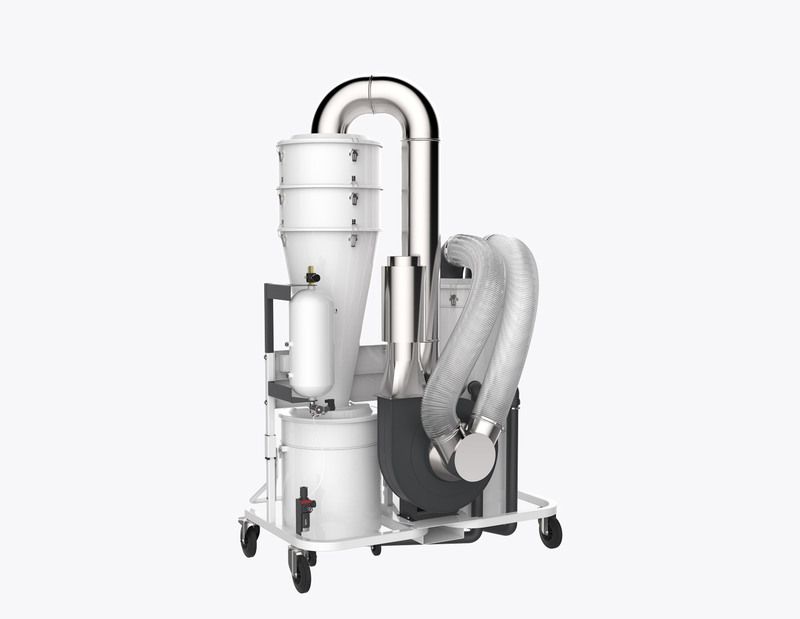 It allows the operator to quickly and easily monitor the level of contamination of the filter. Thanks to such a device, the operator is able to recognize in real time the filter condition and the efficiency of the whole vacuum cleaner. Afterwards, the operator can choose to clean the filter (in manual or automatic mode) and also manage the remote Start&Stop control option. This is a sieve made of a perforated sheet that allows, during suction, to retain the residue generated during blasting oprations and in general dirt. It has two comfortable handles the permit the removal of the container and the repositioning after having emptying the container.